Two lovely weeks touring northern India with Dartmouth Alumni Travel. Magical! More stories, and photos, in this blog post. I’ve just returned from India, where Pam and I had the opportunity to host a Dartmouth Alumni Travel group for a two-week tour of the history, architecture, culture, and arts of northern India. We joined a wonderful group of 12 interesting individuals, and an outstanding tour guide from Odysseys Unlimited, for a bustling tour of Delhi, Jaipur, Ranthambore, Agra, and Varanasi. I think what struck me most about the agenda was its fascinating mix of the sights (palaces, temples, mosques, etc.) with the culture (villages, markets, families. religion) and arts (dance, music, weaving, pottery, jewelry, stonework, carpets, and even paper). Read on for a summary of our journey, and for a sampling of the many photos! I was in Zurich for meetings and managed to set aside a day for hiking in the high country to the east. Fresh snow and low clouds made for an eerily quite day in the mountains. I enjoyed a couple of quick days in the historic district of Delft, The Netherlands, while attending the SafeThings workshop in advance of SenSys 2017. Although it rained on and off, the picturesque streets and canals were a delight to explore. I also ducked into the Old Church and New Church (both hundreds of years old), for a peek at their excellent exhibits. I stayed in Hotel Johannes Vermeer, named after the famous painter, so I was especially interested in those exhibits. Beautiful town! See the photos; the one below is from my hotel room (which was a 4th-floor attic!). 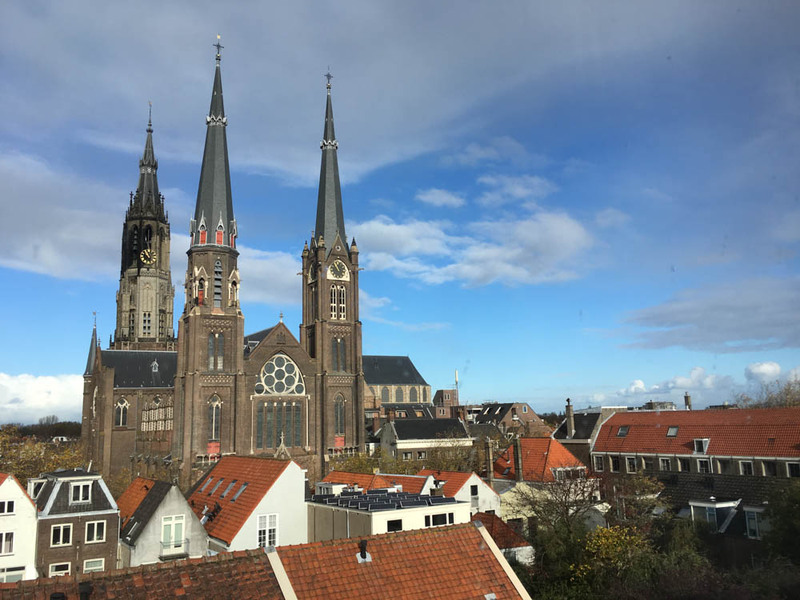 The spire of Nieuwe Kerk, behind another church, as viewed from my hotel room in Delft.